Clara Barton Hospital is a 23-bed critical access hospital, located in Hoisington, serving Barton County, KS. All 23 beds are Medicare certified acute care beds and are certified for participation as swing beds. 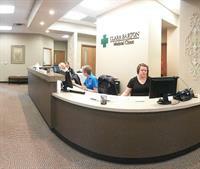 Clara Barton Hospital manages Clara Barton Medical Clinic, Clara Barton Medical Clinic-Great Bend, and Russell Family Medical Care, which are designated Rural Health Clinics. Our RHCs provide primary care to over two-thousand patients each month. Clara Barton Hospital also manages Clara Barton Surgical Services, with both a General Surgery clinic and an Orthopedic Surgery clinic. Clara Barton Hospital and its affiliates are dedicated to meeting the health care needs and improving the quality of life for the community we serve. We continually pursue clinical excellence in an atmosphere of caring and compassion. We are deeply committed to serving all in need within our resources.